This is the current state of the interior. It’s always tempting to me to start putting in furniture before the building work is done. In this case it did help me make decisions, for example I divided the kitchen area with different wallpaper from the living room. 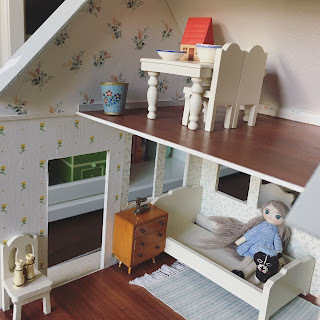 This was my first time doing dollhouse wallpaper and it was a bit tricky but I love the way it looks. Here’s my tip: trace the pieces of your house before assembly then you can use this as a template for wallpapering. Looking forward to seeing it with the trim added. For this house I decided to paint the “hardwood” floors. One of my other changes to this kit was to narrow the top floor to increase the light in the house and make it easier to arrange furniture downstairs. And then I can add a little ladder for access. I hope you are enjoying seeing the tiny house in progress! 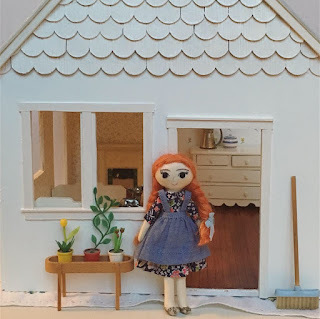 If you visit my Instagram @tinyhandmadedolls you can click on the tag #tinyhandmadedollsdollhouse to see all my dollhouse related posts including the still in progress Glencroft! I’ve been building a new doll house for the Tiny Handmade dolls and posting about it on my Instagram account @tinyhandmadedolls. I find it easier to post on Instagram because blogging with my phone isn’t great. Does anyone have an app to recommend? 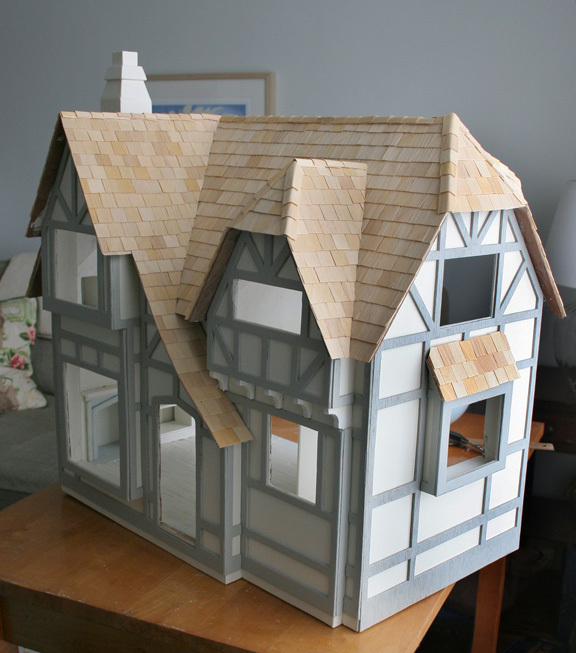 So as you will know if you've read my previous posts, I've been working on finishing my first doll house, a 1:12 scale project. But secretly, without posting about it, I've acquired other houses. I'm sorry I haven't had the chance to share but it's been quite busy. 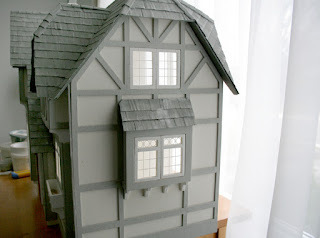 I really wouldn't have room for another 1:12 house, so I've been trying out other scales. 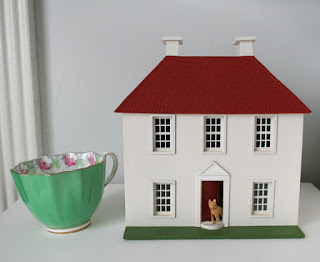 I became captivated by the little 1:48 (quarter size) house kits available from Petite Properties in England and picked out a simple house (the Honeysuckle basic house kit) to try. Although I do like the way they're usually finished with a realistic shabby chic style, I tried something different for my house. This house is inspired by vintage toy houses, that are often painted in simple colours like cream, red and green. I found the kit very easy to put together, but of course any kit can be as challenging as you want to make it. I also tried out a few 1:48 furniture kits also from Petite Properties. 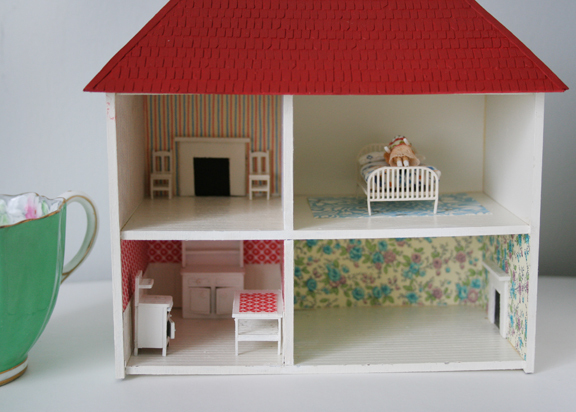 Because the furniture kits are laser cut there's lots of nice tiny detail but they are, of course, very delicate. I haven't finished the interior yet, but it was fun using patterned paper to make wallpaper and adding trim. 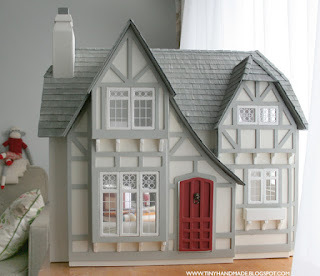 Because it's so small you can make fireplaces from cardboard and cut trim (and roof shingles) from cardstock. There are still more things for me to do in the interior but you can get the general idea from this picture. 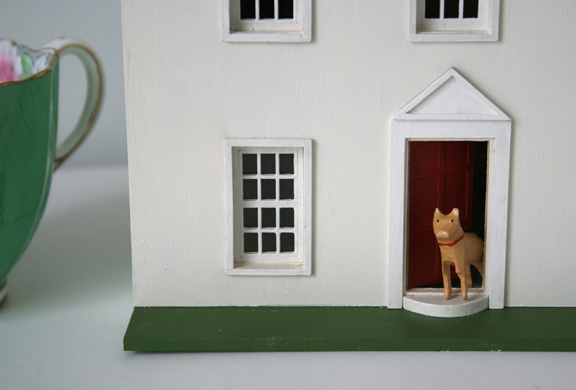 The tiny wooden dog was found in an old sewing box I bought at a vintage shop. Now he has the perfect home. I had fun dressing the bed with a striped mattress, floral coverlet, sheet and pillows. I had also bought a tiny handmade penny wooden doll on Etsy (Renee Bowen Miniatures), and she is also the perfect size for this house. I made a tiny outfit for her and she is pictured here on the bed. 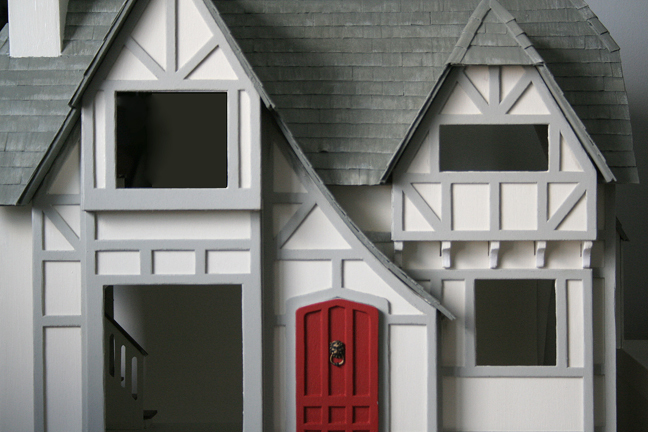 So really, it was quite practical for me to buy this house, in order to store these 1/4 scale miniatures and be efficient and well-organized. Right? I've now installed all the windows on my Glencroft. That is, 15 windows total! (nine in front, two on one side, four on the other) They all have little screen printed white bars on them that are quite charming and I'm happy with the final results. Incidentally as you can see in the picture I added the flower box and the rest of the brackets that go under the windows and flower box as well. I realized that I could go ahead and install the windows without worrying about the interior trim yet as long as the frames are flush with the interior walls. So I can still wallpaper before installing the interior window (and door) trim. The only thing I can say about installing them is that it was a lot of work and I felt like I was installing real windows! Well not really. But here are the steps. Punch out the windows from their sheet, punch out the acetate from their sheet, punch out corresponding window trim and sills. Sand, sand, sand. Prime all the pieces. Paint all the pieces. Paint them all again. Glue the acetate to the frame then glue the other half of the frame and clip to dry. Scrape and sand and cut slivers away from the window gaps and then the windows themselves so that they would fit. 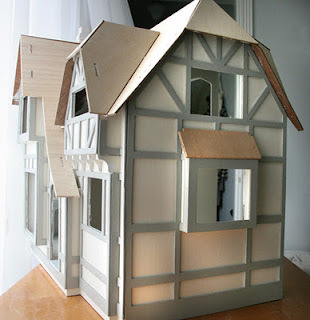 Glue the windows in place and wonder why you were ever crazy enough to consider hinging them all. 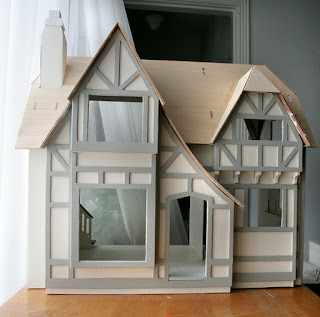 And voila, the results are pretty windows that fit very snugly and are fun to peek through. So I did kind of mess up the roof at first. I painted it with some paint I already had that seemed to be very dark grey. It was too dark. So I tried again with a lighter version by mixing the dark grey with the trim light grey colour. 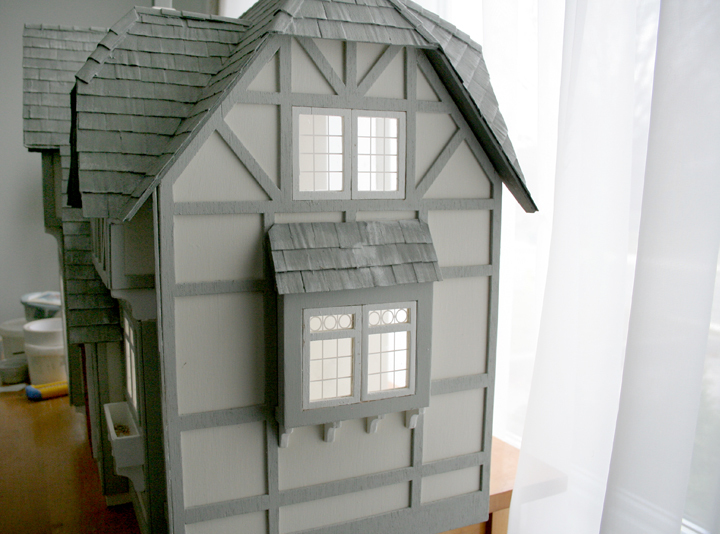 The trouble was the dark grey had a lot of blue so the roof ended up looking kind of grey-blue which didn't look right next to the grey trim. So I tried painting it again with the light grey trim paint and that looked sort of insipid and not great either. I was starting to sort of not like the house anymore. Between you and me it wasn't the first moment when I had regretted the whole enterprise. Finally I decided I would have to buy some new paint and found the perfect slate grey in a matte finish from my local paint shop. Then I layered on a lighter grey by mixing it with the trim grey. And finally I like my house again. 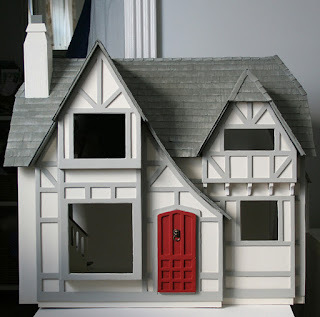 I had assembled and primed the doors already, so I also painted the front door in a nice dull red that creates a nice classic dolls' house colour scheme of grey, cream-white and red. The door has a lion knocker on it as well that I bought from the UK on Ebay. For some reason when I had barely started my kit I had always had the idea to get a lion door knocker, so it was nice to finally find one I liked. It also came nicely antiqued. The door isn't attached yet, I need to buy some hinges and doorknobs as well. Does anyone know where to find some that aren't shiny brass? My Glencroft kit came with roof tiles so I used the ones in the kit. They were the rectangular ones that come in sheets. I made a few mistakes applying them, so I have some tips to share. First of all you really need to measure the placement of each row and draw a pencilled line. 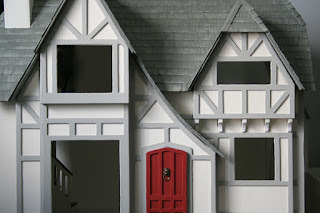 For some of the small areas of the roof you will need to tweak it a bit to make each facet of the roof line up with the others. So the individual rows may not be exactly the same width apart. Don't get impatient and start gluing tiles before you've done the pencil lines exactly where you want them thinking you can just sort it out as you go along. You will end up with uneven tile rows that look wonky. Ask me how I know. I actually started one area of the roof with several rows of tiles lined up vertically and forgot to place them in a brick pattern. I was even wondering why it didn't look that great. Sigh. My big tip here is when you need to remove a batch of tiles don't try to pry them apart from each other, just use your putty knife and pry them from the roof in one piece. Luckily the kit came with lots of extra tiles so it didn't matter. The Glencroft roof has lots of facets that require you to trim the end tiles at an angle to fit. So I found it easier to just attach each tile one at a time rather than in strips as recommended in the book. That could just be me though. But if you want to stain them this also makes for a nice variation in the wood tones. I think I'm going to paint them though so this process could probably have been more efficient. 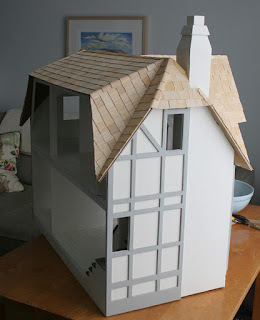 And lastly however neatly you've built your roof and covered it with tiles there will be gaps in the ridges. Here is my solution. You will find that some of the wood tiles are more flexible than others. If you try to bend a tile to fold over the ridge it will likely snap in two. But around 10% of them won't. They will bend over the ridge and you can hot glue them in place and it will cover the gap nicely. 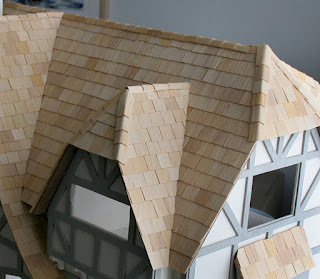 Don't forget to start at the lower or outer end of the roof and work up as you overlap the ridge tiles - like a real roof. Of course I waited until the end to make sure I would have enough tiles. I'm very happy with this solution and I think it looks much better now and matches the real look of cedar shingles. I am actually planning to paint the roof though, so I'll show you that next. I hope I don't ruin it! The next step to finish the exterior of my doll house was the trim. I painted it grey and I'm very happy with the way it looks. There's less contrast than with dark brown stained wood and I think it fits with a Tudor-style house rather than a historically authentic Tudor house. 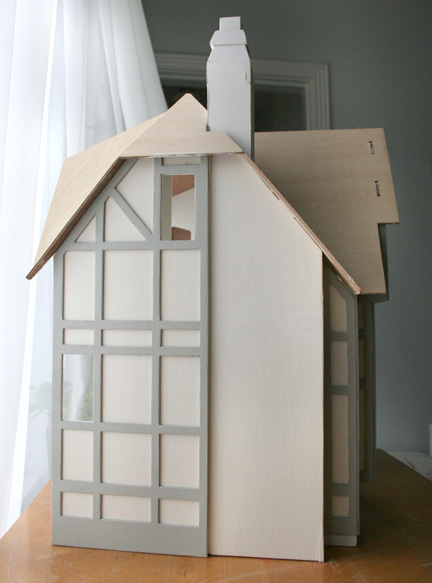 Now I'm finishing up the extra bits like the flower box, chimney and brackets. Then I may start on the roof. After that it will be time to sort out the interior. With the roof on I can now finish the ceilings and if I'm going to add wallpaper, and I think that I am, I need to do that before installing the door and window trim (and therefore the doors and windows). 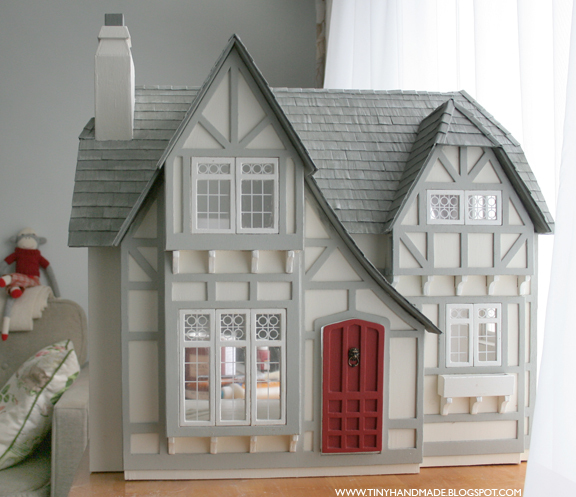 I'm thinking a lot about hinging the windows and doors and would love some tips on that. I'd rather not glue them all in a fixed position, but maybe that wouldn't be so bad for the windows at least. There are quite a few of them! In a nutshell, I'm a freelance illustrator and inveterate crafter. Click on the picture above to see my full profile. 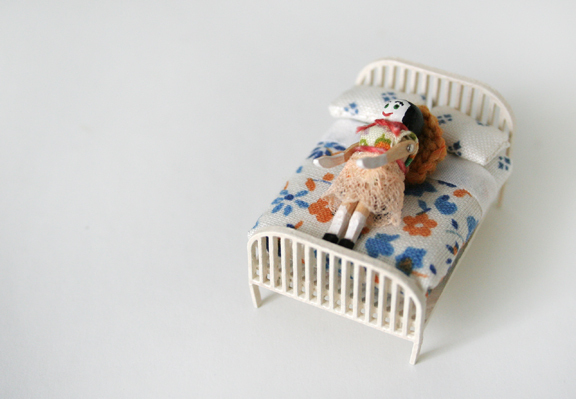 You can email me at tinyhandmade [at] clairelouisemilne.com. Thank you for your comments and for linking to me! Please do not use any photos or content from tiny handmade blog without permission.